Professional Car Care for any Car Owner! FREE shipping on ALL CDROM Orders. Add the installation CDROM for only $5.00 Select the CDROM option below. The Standard version includes specialized vehicle maintenance schedule requirements for Cars & Trucks. The PRO version includes specialized vehicle maintenance schedule requirements for Cars, Trucks, Motorcycles, Boats, Lawn Mowers and supports tracking maintenance on "Hourly" items like generators, Tractors, small planes and more. You can create unlimited gauges to track maintenance items and it can send you Email reminders when any service is Due. 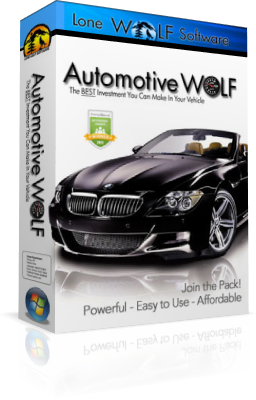 Maintain your Vehicle like a PRO with the Original Car Care Software for Windows.